Enough isn't said about conviction in performances. Yes, vocal talent plays a major role in commanding a stage. The same goes for the backing instrumentation, staging, choreography and all the other usual suspects. But when it comes down to it, conviction is vital, often detrimental to elevating a performance to a whole nother level. And we're completely obsessed with the amount of conviction that's oozing through this cover video to Robyn's "Dancing On My Own" by The Undertones of Notre Dame University. The a cappella cover is simply mesmerizing as you're drawn in by arranger and soloist Gregory Corning's pure vocals. It's endearing, comforting, honest and despairing all at once. And the backing group adds just the right amount of substance to let the listener become totally engrossed with the heart of the song, manned wonderfully by Corning. It's hard not to feel every ounce of heartbreak that the Undertones are dishing out in this video. 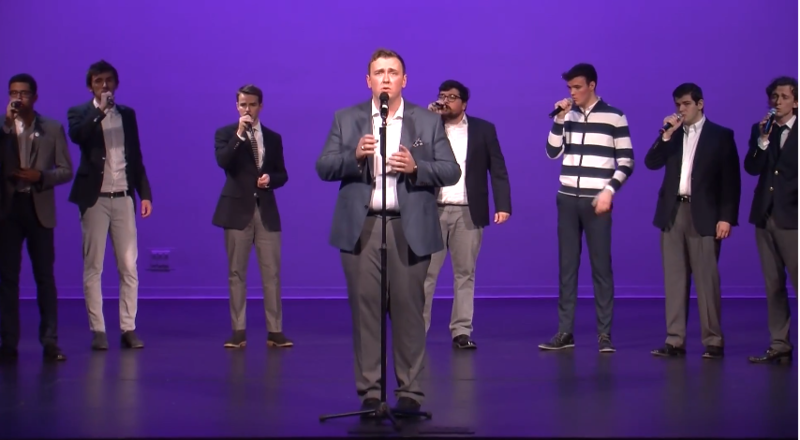 It's performances like this that constantly remind us of the power of a cappella music.